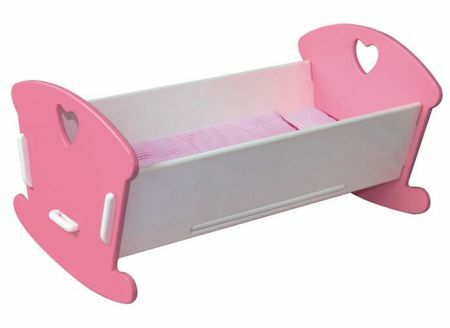 Wooden Toy Doll Bed Cradle is a lovely place for all you dolls and teddies to be gently rocked to sleep. This bed / cradle is a simple pink and white and slots together without and bolts or screws so it is solid, safe, easy to put together and fast to take apart if you want to store it. This toy come complete with mattress pillow and sheet, making it all ready for lots of roleplay games. We like this because: "Lovely complete toy and beautiful lock together construction."